Also, when you dont apply makeup, use it before going to sleep. Your face gets dirty with air pollutants and other substances. Toner is optional. I use it a lot because I like the fresh sensation it leaves on my face. Also, it balances the skins PH immediately and makes some creams absorb and penetrate rapidly. If youre going to buy one or you use one already, its important that it adapts to your skin type and needs. For example, if you have sensitive skin, buy a calming one, or if you have greasy skin, buy an astringent one. This is all you need to keep your skin clean! Now lets look at treatment and moisturizer. If you have not done it, youre in time to start now. There are contours of all types and for all ages. If you have bags or dark circles under your eyes, buy one that will help you with this problem! You will quickly notice the difference. If you already use one, remember to apply it before the moisturizer. The contour cream has a lighter formula than any other cream; thats why it should always be applied beforehand and around the eye with small, light touches. You should always, always moisturize your skin. Cream not only gives you elasticity and moisturization but also protects you from external agents. 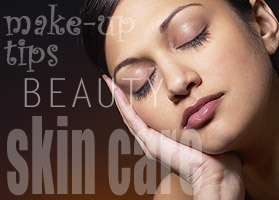 Choose a cream that adapts to your type of skin. Do you have greasy skin? Buy a cream thats oil-free for oily skin types. Do you have sensitive, dry skin? Buy a cream that apart from moisturizing your skin completely will calm your skin. Its better if you use the same cream in the morning and at night rather than, by having to buy a night and a day cream, reducing the quality. The ideal is to have two, but if you cant, buy a good one and use it day and night. Remember that its not necessary to use a lot of the product, just enough to cover your face and neck. You can buy a good exfoliating lotion for a decent price. The exfoliating lotion can change the whole look of you skin within minutes. Buy one that adapts to your skin type. There are also exfoliating lotions for dry skin. They are very soft, but they produce a great result. Those of you who have very sensitive skin should be careful and try the product on the inside of your forearm before buying it. Make sure its a good exfoliating lotion for your type of skin. Buy exfoliating lotion often. It removes the dead cells from your skin. Apply it softly. Youll notice how your skin looks fresh and shining and how you can extend your makeup foundation better and more uniformly. If you dont have much money, go to the pharmacy and buy an affordable lip moisturizing treatment. If you want to invest a bit more, you can buy one that even solves problems with small wrinkles or gives greater volume. and our advice about each one of the products that weve recommended. Maria Llorente is a qualified Make Up Artist and Beauty expert. You read more of her articles at: http://www.promaquillaje.com.